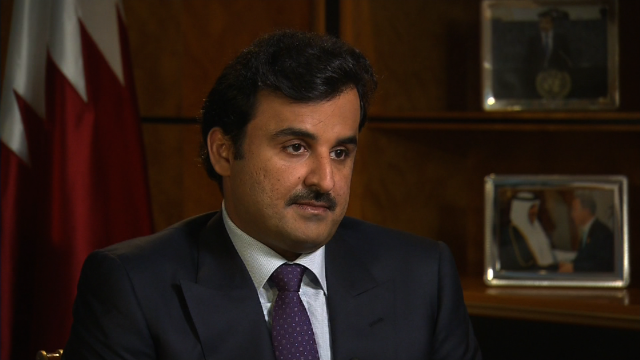 Qatar’s ruler Emir Sheikh Tamim bin Hamad al-Thani stressed that demand by the Saudi-led group to shut down Doha-based News Channel Al Jazeera is unfeasible and tantamount to giving away the country’s sovereignty. “We’re not going to shut down Al Jazeera,” he told host Charlie Rose, in an interview aired Sunday by American CBS ’60 Minutes’ program. Created in 1996, Al Jazeera has found itself in the eyes of the storm this year after Saudi Arabia, United Arab Emirates (UAE), Bahrain and Egypt severed ties with Qatar, they accuse of promoting terrorism. The quartet, few days in the midst of crisis triggered on June 5, issued a list of 13 conditions including the closure of the channel and the reduction of diplomatic ties with Iran. Doha vehemently lambasted the accusation and the conditions adding that the list was made to be rejected. The 37-year old monarch also said that the boycotting countries are wary of his country’s independence and by imposing the blockade they wanted a regime change. Early this month, Qatari authorities froze assets of Sultan Bin Suhaim al-Thani and of Abdullah bin Ali al-Thani, two men belonging to the Qatari royal Thani tribe, but believed close to Saudi Arabia and the UAE. The two men were reportedly on the verge of announcing a rival government in exile. Sheikh Tamim however noted that he is more than willing for dialogue to end the crisis with his neighbors. In the meantime, Bahrain has rejected to sit with Qatar at the next Gulf Cooperation Council (GCC) summit if Doha does not change its attitude. It also called for a freeze of Qatar’s membership in the organization until the tiny country abides by the conditions put forward. Written by: KanelkaTagba on October 30, 2017. Posted by KanelkaTagba on Oct 30 2017. Filed under Gulf News, Headlines. You can follow any responses to this entry through the RSS 2.0. Both comments and pings are currently closed.